WW I: An American Perspective First reaction to the outbreak of war in Europe was one of shocked surprise and withdrawal. 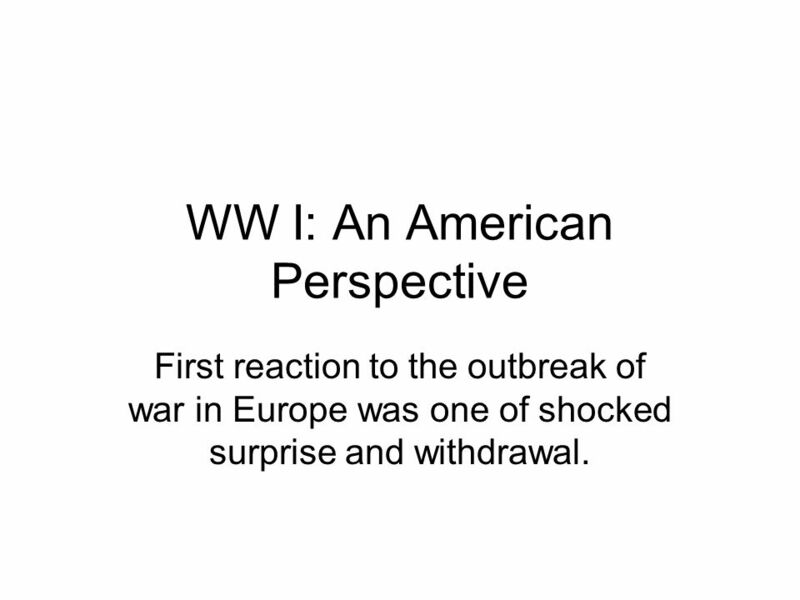 1 WW I: An American Perspective First reaction to the outbreak of war in Europe was one of shocked surprise and withdrawal. 2 American Neutrality Pres. Wilson urged Americans to be neutral in fact as well as in name and impartial in thought as well as action. Although in 1914 American sympathies were divided, most Americans supported the Presidents policy of neutrality and prayed for an early end to the war. 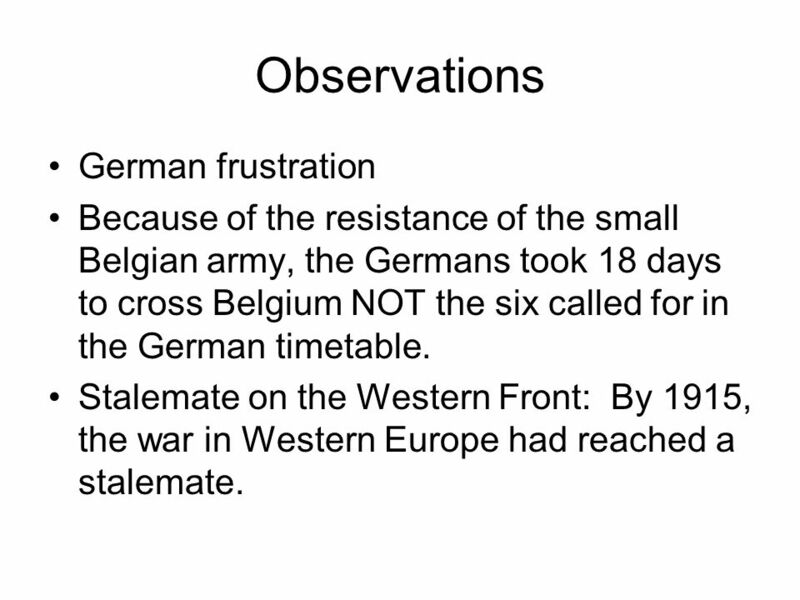 3 Observations German frustration Because of the resistance of the small Belgian army, the Germans took 18 days to cross Belgium NOT the six called for in the German timetable. Stalemate on the Western Front: By 1915, the war in Western Europe had reached a stalemate. 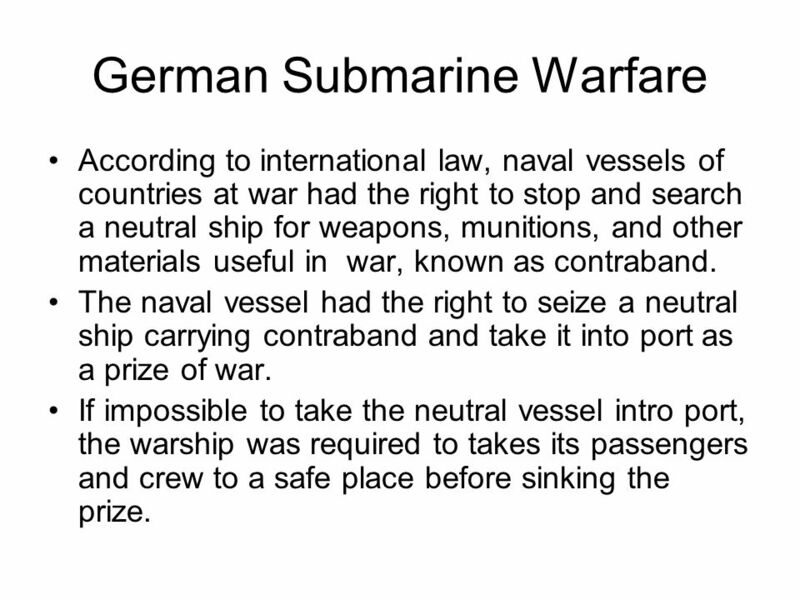 4 German Submarine Warfare According to international law, naval vessels of countries at war had the right to stop and search a neutral ship for weapons, munitions, and other materials useful in war, known as contraband. The naval vessel had the right to seize a neutral ship carrying contraband and take it into port as a prize of war. If impossible to take the neutral vessel intro port, the warship was required to takes its passengers and crew to a safe place before sinking the prize. 5 Subs Subs were designed to lurk in the ocean depths, to strike suddenly without warning at an enemy ship, and to slip away quickly before a counter attack. Germans notified Pres. 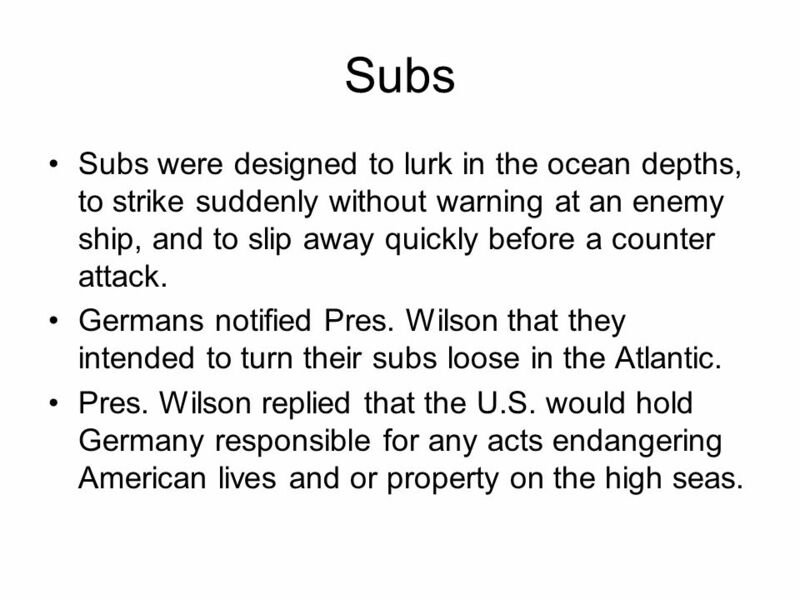 Wilson that they intended to turn their subs loose in the Atlantic. Pres. 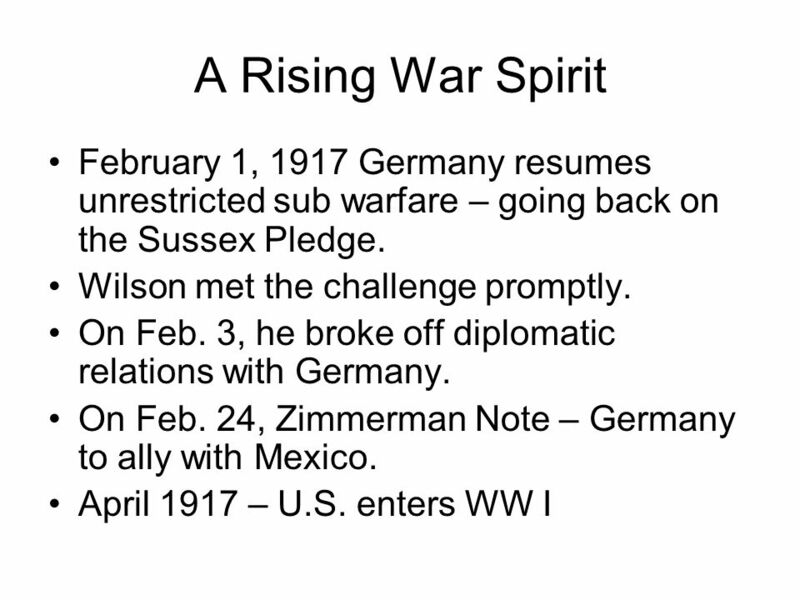 Wilson replied that the U.S. would hold Germany responsible for any acts endangering American lives and or property on the high seas. 6 March 28, 1915, a British steamer was torpedoed near Ireland – killing more than 100 people including one American. 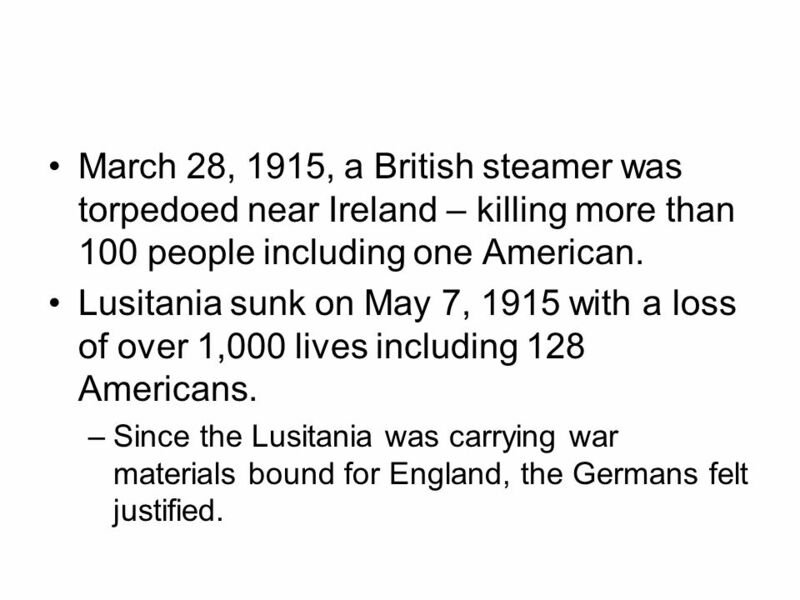 Lusitania sunk on May 7, 1915 with a loss of over 1,000 lives including 128 Americans. –Since the Lusitania was carrying war materials bound for England, the Germans felt justified. 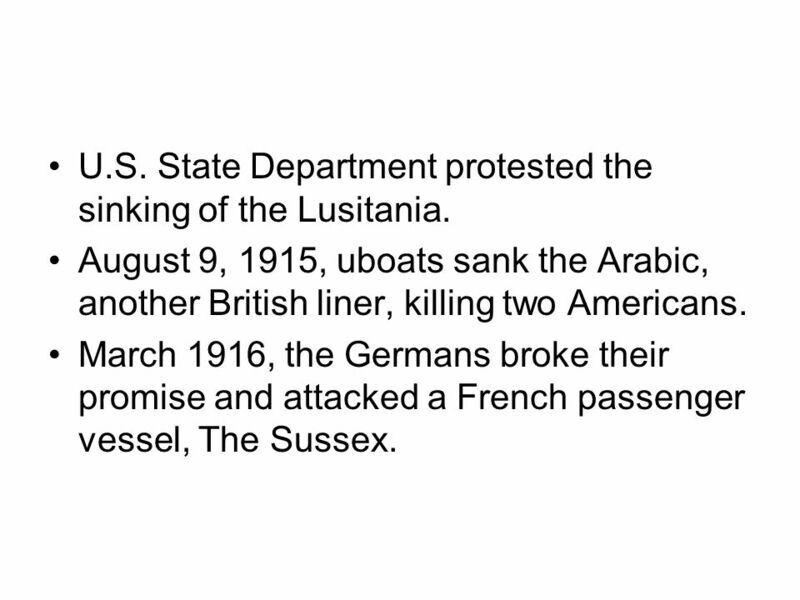 7 U.S. State Department protested the sinking of the Lusitania. August 9, 1915, uboats sank the Arabic, another British liner, killing two Americans. March 1916, the Germans broke their promise and attacked a French passenger vessel, The Sussex. 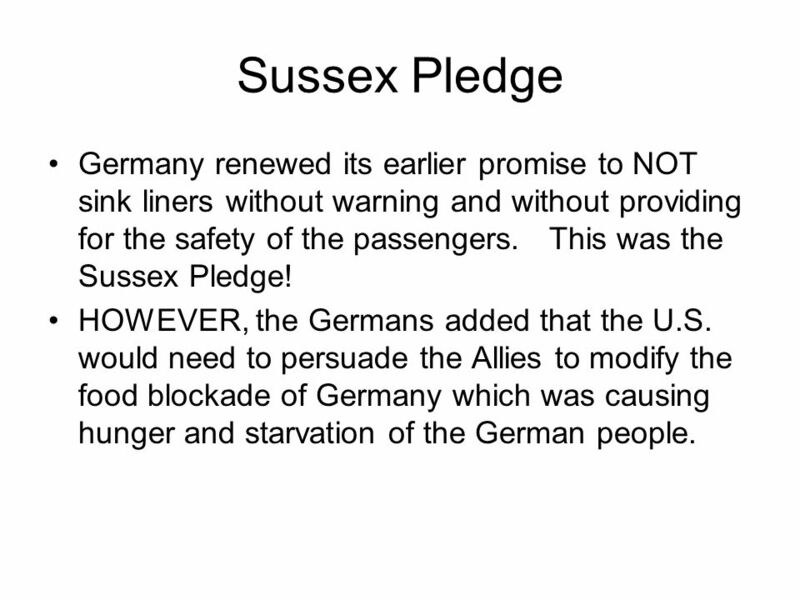 8 Sussex Pledge Germany renewed its earlier promise to NOT sink liners without warning and without providing for the safety of the passengers. This was the Sussex Pledge! HOWEVER, the Germans added that the U.S. would need to persuade the Allies to modify the food blockade of Germany which was causing hunger and starvation of the German people. Download ppt "WW I: An American Perspective First reaction to the outbreak of war in Europe was one of shocked surprise and withdrawal." BELLWORK 1. Describe Wilsons policy of Moral Diplomacy. 2. How was Moral Diplomacy different from the policies of the other Progressive presidents, Roosevelt. WW1 #10: U.S. Enters the War Quiz today! 1.All of the following countries were members of the Allied forces EXCEPT: A.Britain B.Russia C.Italy D.Germany. U.S. Enters WWI. Why wasnt the U.S. in WWI from the Start? Isolationism - The U.S. attempted to stay neutral U.S. citizens believed that U.S. should stay. Chapter 10 World War I Part Battle of Jutlandfought off the coast of Denmark, May- June, This fight between the British and the. Causes  Britain blockaded Germany. No military supplies were to enter – later included food. American merchants did not fight blockade Germans.   Many Americans wanted to remain isolated from European conflicts  War not in best interests of America  Panama Canal completed in 1914 – one week. WWI starts in 1914 US is neutral Does ship supplies to both sides of war Most Americans pulling for Allies Americans stay out of war because it is not. World War I Intro: Europe Before the War Germany – Strongest Army; Allied to Austria- Hungary (AH); Wanting to establish itself as a European/World. U.S. Involvement in WWI. Anti-War U.S. under Woodrow Wilson – neutral Americans strongly anti-war. What was the U.S. doing while Europe was fighting WWI? Reasons To Go To War World War I. The German navel blockade (pg. 670) Germany had an effective sea weapon known as the submarine. After they were able. Was WWI a “just” war? (Aka: knowing that it was one of the biggest wars our world has ever seen, do you think the causes of WWI were reasonable? Does the. What were the concerns of war and why did some question neutrality? Map Quiz Americans Question Neutrality The War Hits Home Homework: Section 2 Notes. Causes of America’s entry into WWI. 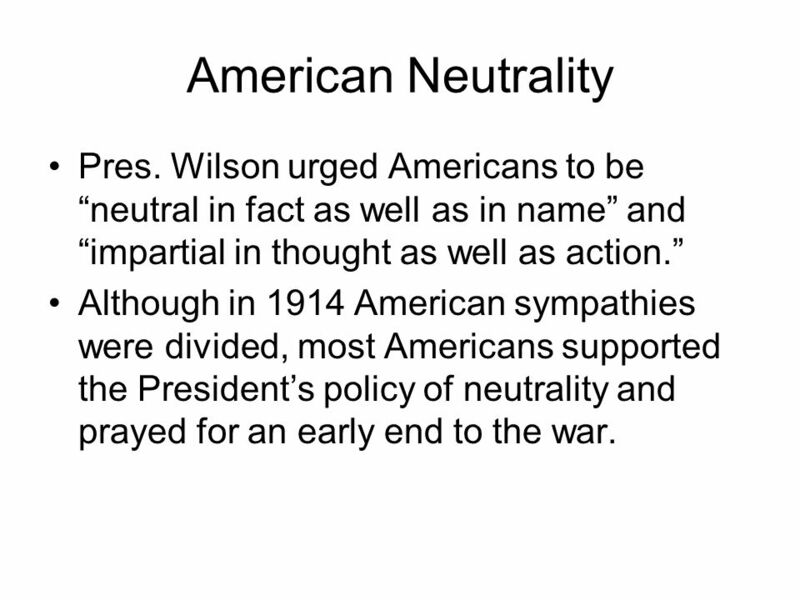 Neutrality In the beginning the United States wanted to remain neutral. The war was happening in Europe. Wilson was. Review 1) List at least 3 techniques used in propaganda 2) List at least 2 goals a government might want to accomplish with a propaganda poster 3) Describe.